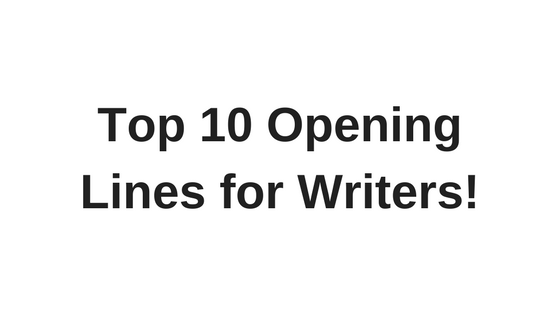 Top 10 opening lines for writers. Opening lines can be the difference between a reader reading your copy or ignoring your hard work. The right opening statements or opening lines can help keep your reader or buyer around for longer. Personally I think opening lines & statements will eat more than 80% of the marketing budget. My top 10 opening lines for writers below is in no particular order. Every opening line & statement should be AB tested. Below are some really powerful opening lines you can test and work with today if you write or send emails to subcribers. 1. It’s no secret that. 2. Let me ask you a simple question. 3. If I’m not mistaken, you’re the kind of person who. 4. I’m extremely pleased to tell you that. 5. Imagine being able to get a. 6. Believe it or not. 7. Sometimes I wonder why. 8. Don’t be caught without. Q: Are you a Writer, Blogger or Internet Marketer? Before you leave this page I highly recommend you take a quick look at this very powerful must have book for writers and internet marketers like you. This book was one of the best investments I made for all of my online businesses. P.S. Just trust me on this.